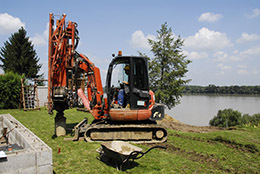 Piles are slim underground structures that transfer superstructure forces to the subsoil. 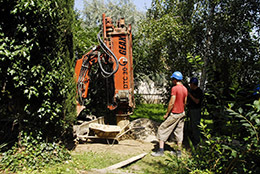 Its two main application domains are: deep foundations and construction pit shoring. Different solutions are used depending on the applied materials and execution technologies. 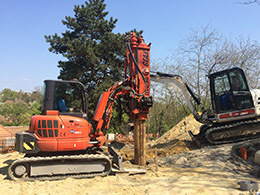 Pile drilling is a pile installation technology where piles are constructed in drilled cavities in the subsoil (drilling can be made with or without casing), and by filling them with reinforced concrete. 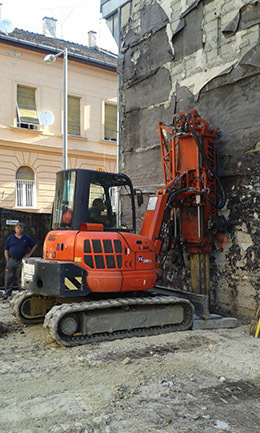 The drilled reinforced concrete piling technology used by our company differs from the largely applied CFA piling. CFA is an acronym that stands for Continuous Flight Auger, thus, a piling method using a continuous screw. Along the whole length of the screw, there is a concrete pouring cavity. The screw introduced in the soil has multiple functions: during boring, it shall reach the required depth, continuously supporting the borehole, than it shall be able to pour concrete under pressure in the borehole - simultaneously with the soil excavation. At the end of the concrete pouring/soil excavation phase, the pile reinforcement is vibrated down. 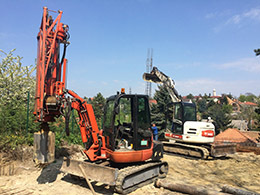 Meanwhile, in case of pile installation using boring machines with kelly bars, soil excavation from the borehole is performed by steps. 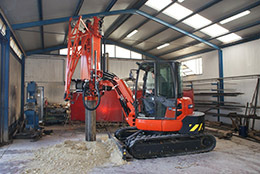 Boring can be performed with or without casing, in function of the soil characteristics. 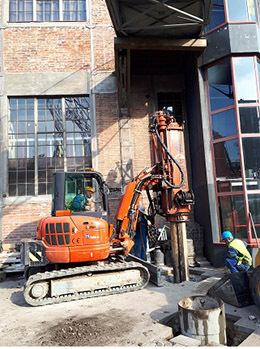 After reaching the pile bottom, the reinforcing bars shall be installed in the borehole, than, from bottom up, concrete pouring shall be started. As concrete pouring advances, the eventually used casings can be retracted. 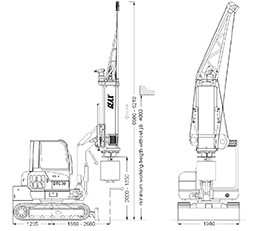 The technical solution of piling with the machine Geax DTC30 is equivalent to CFA piles.